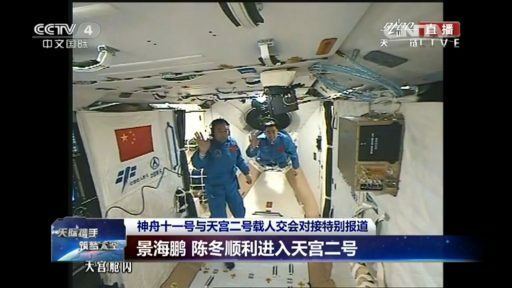 A pair of Chinese Astronauts completed an out-of-this world link-up on Tuesday when their Shenzhou-11 spacecraft pulled into port at the Tiangong-2 space laboratory to kick off a month-long stay that will set a new record for the longest mission of a Chinese crew, continuing to press toward a continuous human presence in orbit. Entering the ‘Heavenly Palace’ later on Tuesday, veteran Shenzhou Commander Jing Haipeng and rookie Astronaut Chen Dong are facing a packed schedule dedicated to research covering 14 different areas – attempting to grow rice and lettuce in microgravity, testing a robotic arm and monitoring physiological changes undergone by the human body during prolonged exposure to the space environment. 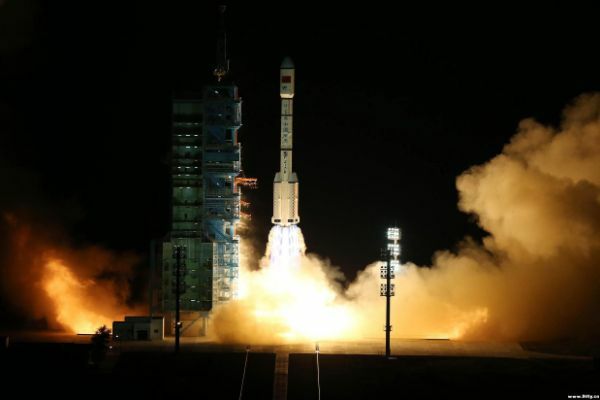 The crew duo began their work week with a thundering blastoff from the Jiuquan Satellite Launch Center at dawn on Monday, lifting off at 7:30 a.m. local time (23:30 UTC on Sunday) atop a Long March 2F rocket. 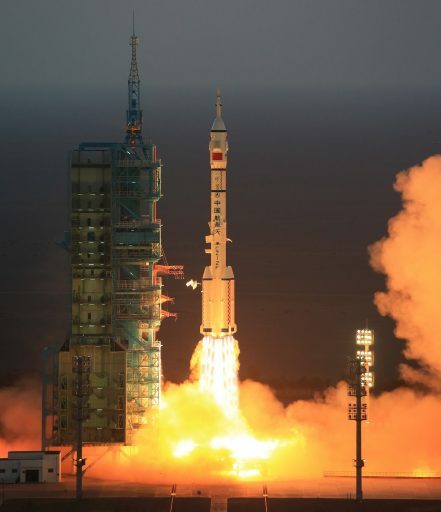 Firing at full throttle, Long March 2F climbed into the morning haze over the Gobi Desert with a thrust of 604 metric ton-force and swung to the south east to overfly the Chinese mainland as it started a high-speed chase of the Tiangong-2 space lab lifted into orbit last month. 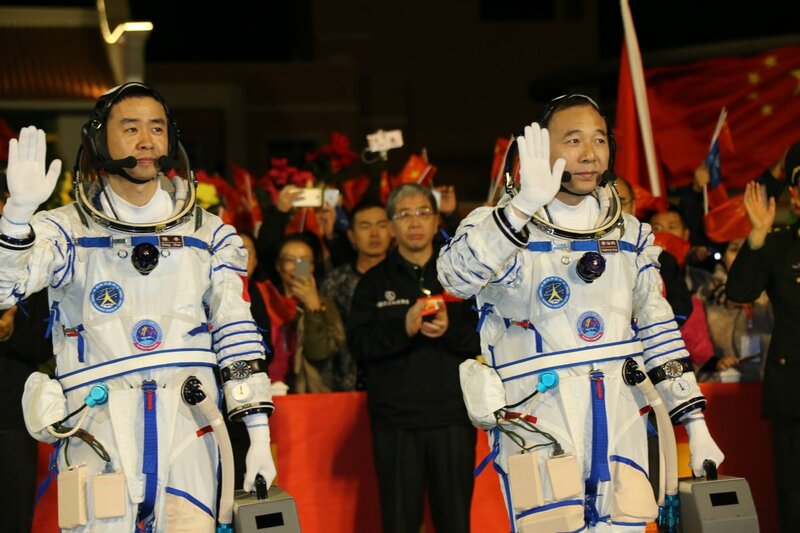 Saluting their ground teams and the Chinese public a few seconds before ignition, the two crew members enjoyed a smooth ride on the 58-meter tall Long March 2F. The rocket dropped its four boosters two and a half minutes into the flight followed seconds later by the separation of the four-engine core stage, handing duties off to the upper stage for the final push into orbit by firing its engines for nearly seven minutes. 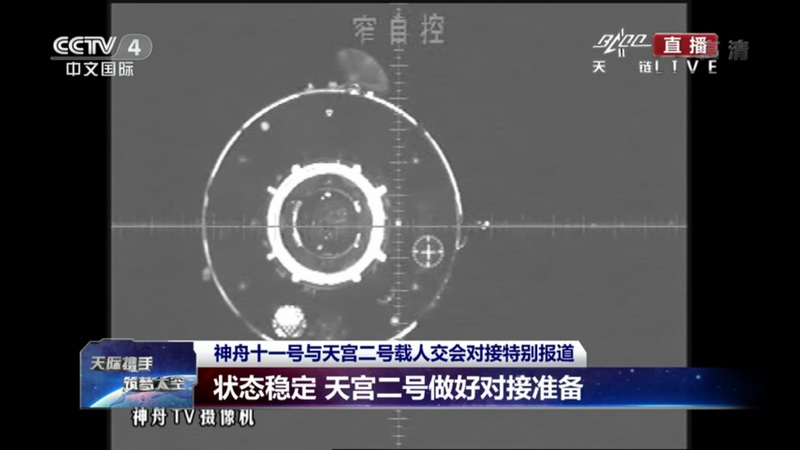 Onboard video showed Shenzhou-11 separating from the carrier rocket nine minutes and 36 seconds into the flight and China’s top space officials declared the launch a complete success after the spacecraft unfurled its two power-generating solar arrays. 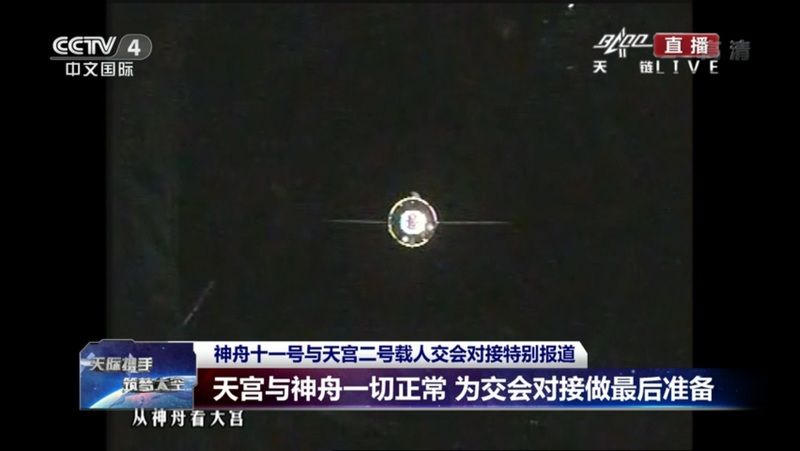 The mission was aiming for an orbit around 200 by 330 Kilometers, 42.8° from where Shenzhou-11 was to climb up to Tiangong-2 from behind and below, starting out several thousand Kilometers behind the space lab. Tiangong-2 – launched by a Long March 2F on September 16 – maneuvered into an orbit of 379 by 389 Kilometers where it awaited the arrival of its crew. 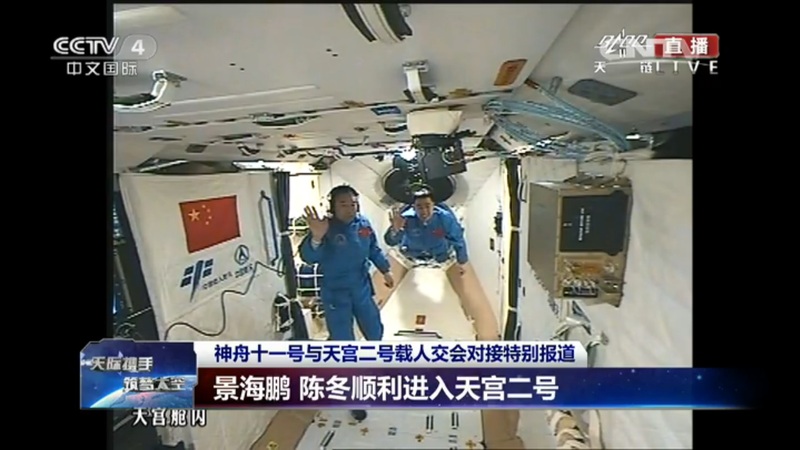 Shenzhou-11 is China’s sixth crewed space mission and the third to complete a docking in space, building on the successful Shenzhou-9 and 10 missions in 2012 & 13 that visited the first Heavenly Palace for two weeks each. 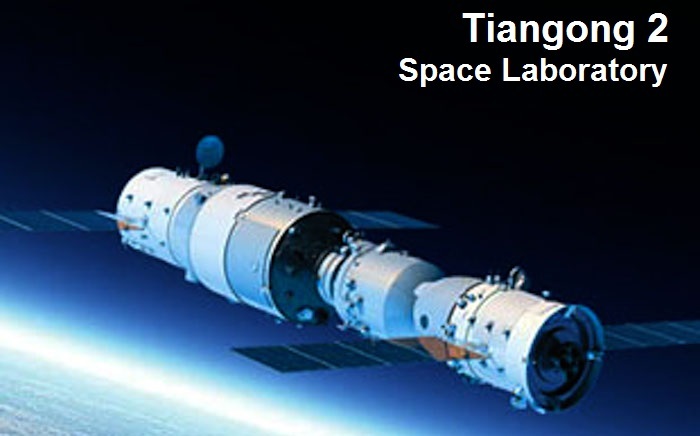 Tiangong-2, while appearing identical to the first TG spacecraft, incorporates a number of modifications the Chinese implemented after learning about in-space habitability from the first Tiangong crews. These modifications range from trivial things such as hand and foot hold placement to more advanced changes including the implementation of a lighting and sound system tuned to positively affect the crew’s sleep-wake cycle. 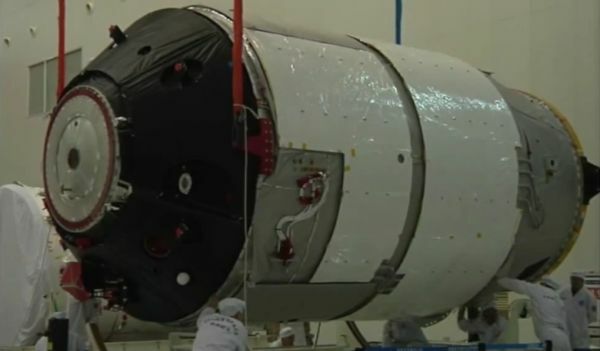 The Tiangong spacecraft is comprised of two modules, a Service Module hosting the propulsion and power systems, and an Orbital Module that facilitates the crew quarters and in-cabin science facilities with a total habitable volume of 15 cubic meters. The combined Shenzhou-Tiangong complex has a length of 19 meters and a combined mass around 16 metric tons. 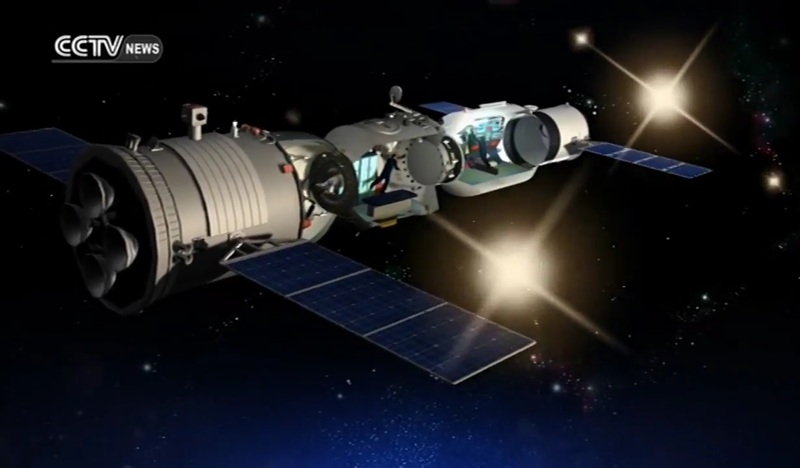 Tiangong-2 marks the final stepping stone ahead of the deployment of a large modular space station starting as early as 2018. 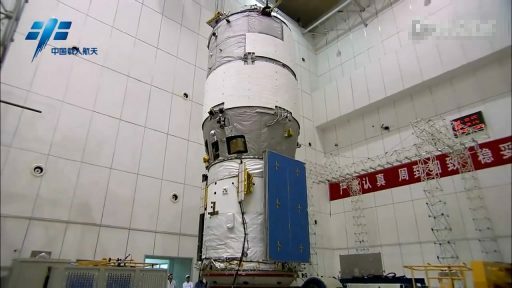 In addition to demonstrating a longer crewed mission, Tiangong-2 also sets out to demonstrate China’s cargo architecture, serving as target for the first Tianzhou resupply craft set for a test flight in April 2017 that will attempt to transfer propellant from the cargo craft to Tiangong’s tanks – a critical technique needed for the operation of a long-term space station. Shenzhou-11 is the only crewed visit to Tiangong-2 and will more than double China’s previous record for the longest crewed Space Mission. Tiangong-2 was designed to provide resources for a 20-day mission with a crew of three, but it was decided to cut one crew member in order to extend the mission to a full month with a crew of two. The orbital link-up between Shenzhou-11 and Tiangong-2 began a short time after launch when the approaching spacecraft circularized its orbit at 335 Kilometers. Another pair of engine burns lifted the Shenzhou craft into an orbit of 366 by 376 Kilometers from where it continued catching up with Tiangong-2 for the initiation of the close-range rendezvous. Relative navigation was initiated when the two spacecraft were 52 Kilometers apart and a proximity communications link could be established for the exchange of satellite navigation data. A UHF radar delivered range and range rate data to guide Shenzhou through its far-field approach. A planned hold at five Kilometers provided time for a systems assessment prior to green-lighting the approach initiation maneuver. The sophisticated proximity navigation system was fired up at a distance of 400 meters when the approach entered its second planned hold. 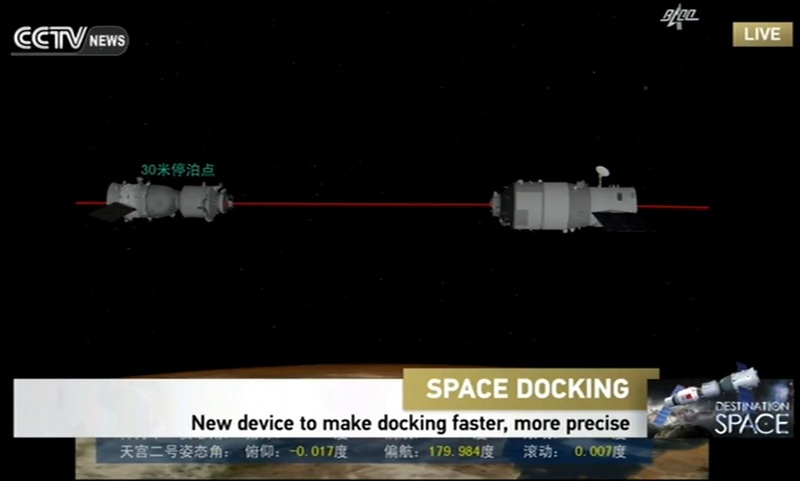 Shenzhou hosts a laser-based system for range and relative rate measurement while an electro-optical navigation system delivers data to an algorithm that determines the relative geometry of the two spacecraft. The entire rendezvous was completed on Auto Pilot, running a complex algorithm that monitored and compared parameters from both spacecraft to determine whether their status is within allowable parameters for each stage of the rendezvous. The smart rendezvous logic is designed to function without crew or ground interaction, automatically holding the approach for corrections when needed. Guided by its rendezvous sensors, Shenzhou-11 lined itself up with Tiangong-2 for a straight-in approach – coming to a third halt at 120 meters to provide time for the two crew members and Mission Control to look at the alignment. 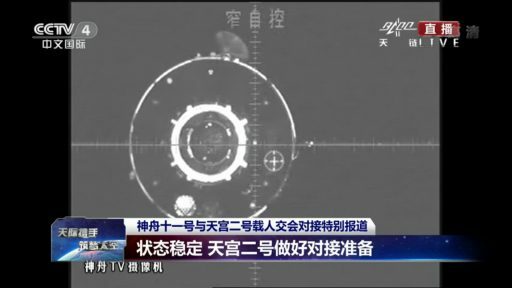 A final hold at 30 meters facilitated the transition between the far-field and close-range laser reflectors on the Tiangong craft. Firing its maneuvering thrusters, Shenzhou-11 initiated the final approach to docking – a slow and deliberate maneuver aiming for contact at a speed of 0.2 meters per second and an error of less than 18 centimeters. 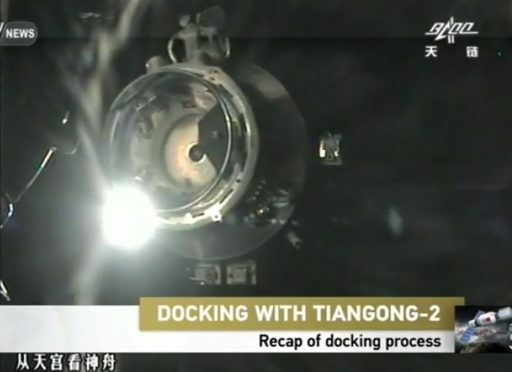 As the active spacecraft, Shenzhou had extended its docking ring while Tiangong kept its APAS docking mechanism in the passive state with the ring fully retracted. China uses a variation of the Androgynous Peripheral Attach System (APAS) that was in use for the Apollo-Soyuz Test Project in the 1970s as well as the Space Shuttle program on both, Mir and ISS missions. Contact was confirmed at 19:24 UTC when the Tiangong-Shenzhou complex was flying 385 Kilometers over the Arabian Sea. With a safe soft-docking, relative motion was allowed to dampen out before Shenzhou commanded its docking mechanism to retract the ring and tightly pull together the two docking rings, in the process securing the coupling via 12 locking-pins. 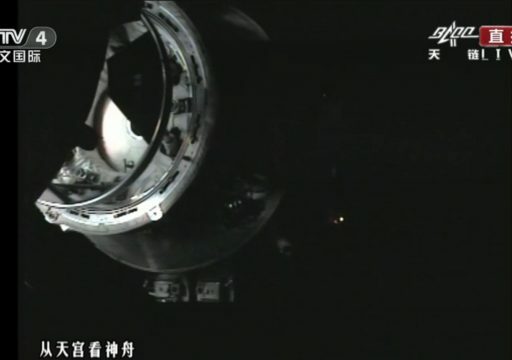 Hard-dock was confirmed at 19:31 UTC, rigidizing the 0.8-meter tunnel through which the crew can enter Tiangong-2. 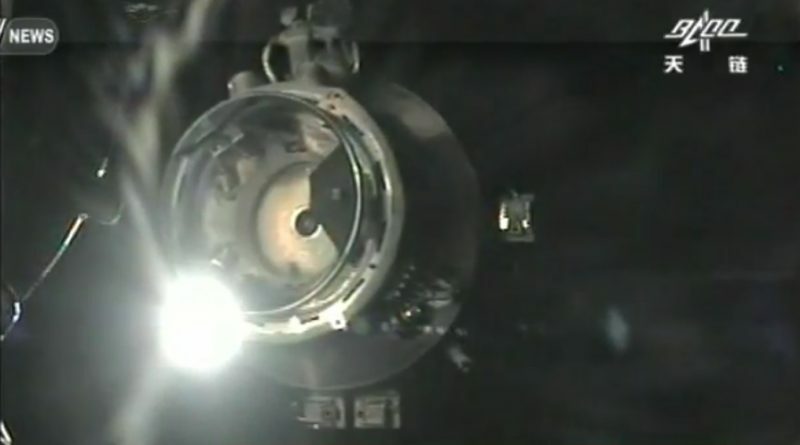 A thorough leak check was performed by the crew before equalizing pressures between the two spacecraft being able to open up the hatches to their home in space for the next month. Hatch opening was marked at 22:25 UTC and Jing Haipeng was the first crew member to float aboard the space lab. 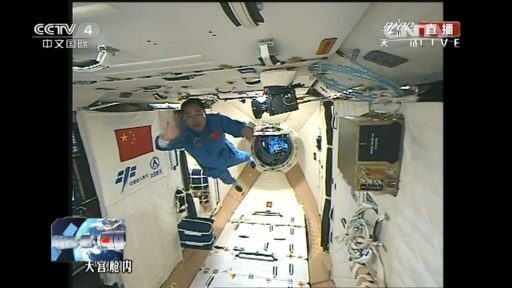 He conducted a quick inspection and activated critical systems before flight engineer Chen Dong was also invited to float from Shenzhou 11 into the Tiangong-2 spacecraft. The two-man crew will stick to a regular work schedule of six eight-hour work days per week plus an additional hour each day spent exercising on a cycle ergometer or treadmill as a countermeasure to muscle loss. As China’s longest mission to date, the crew will get to enjoy some new amenities being introduced for future long-duration flights such as more variety in their orbital menus and drink choices; and an in-flight entertainment system that can provide them with TV and music and also employs virtual reality to keep the crew in touch with Earth. Tiangong-2 hosts a wideband communications system that offers continuous communication with the ground over multiple voice, video and data channels – primarily used for operational purposes, but the crew will also have the ability to call their families whenever they wish to. Much of the internal space of Tiangong-2 is occupied by science facilities and the crew will be tasked with experiments from 14 different areas, most notably plant cultivation, human physiology in space, and technology demonstrations. Tiangong-2 hosts medical facilities to permit the crew to conduct ultrasound measurements to track the degradation of the cardiovascular system during medium-duration exposure to the space environment. In addition to crew-operated payloads, Tiangong-2 hosts a number of external and internal instruments that can be remote-controlled to allow the space lab to serve as an orbital platform for Earth and Space-Science when no crew is present. These payloads include a gamma-ray instrument attempting to pin-point the sources of gamma-ray bursts, a fountain atomic clock tested for future space applications, a quantum communications system supporting China’s ambitions in this novel communications technique and a multi-instrument Earth observation suite for ocean and land surveys. 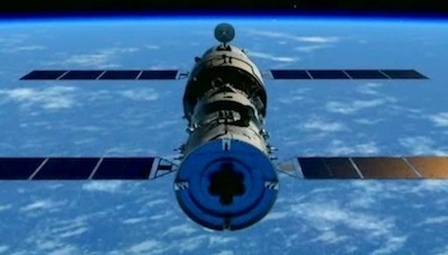 Tiangong-2 will be operated beyond the crew’s departure in November and is hoped to remain functional well after the cargo demonstration next year, taking advantage of its topped up tanks to remain in orbit for several years.